Hardly a morning person, my 6:30 am alarm was met by an automatic snooze. Yet remembering the busy day ahead, I leapt out of bed and quickly began my morning rituals. I would be spending the day at the DYW New Hampshire and Vermont combined state program. 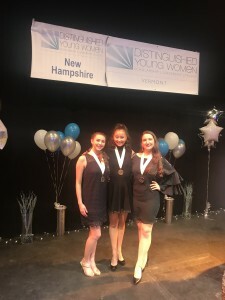 Eager to catch up with my DYW sisters Mara (VT 2017) and Katrina (NH 2017), and meet the volunteers and young women participating in the program, I was excited for the adventure to come. And what an adventure it was! The day began with the trip from my Columbia dorm room to Derry, New Hampshire. Emceeing the event, Michelle Tolson, a former New Hampshire Junior Miss, was kind enough to drive me to the program, and we began the trek north. As any proper road trip should be, the drive was full of great conversation, music, and the occasional nap. Early though the morning may have been, I quickly forgot the time. Arriving in NH, I met the exceptional young women participating in the program. With talents as diverse as Russian spoken word and songs in sign language, the girls reminded me of the wide breadth of talent and passion the program welcomes. It was incredibly special to talk to and interact with the next class and generation of DYW sisters, giving me flashbacks to my own experiences in my state and national programs. Performing a piece, Coming to Life, I grew more nostalgic, feeding my excitement for this summer’s upcoming national program. Looking to the people who make DYW possible, it is certainly a truism that DYW’s greatest asset is its dedicated legion of volunteers. Each volunteer I met was as kind and welcoming as one could hope, speaking to the special nature of DYW’s volunteer community. This was perhaps most true when former New Hampshire Junior Miss, Sarahjayne Howland, drove me all the way from New Hampshire to my ski team’s training trip in Sugarloaf, Maine, at the conclusion of the program. I cannot think of any other community with such an intense level of commitment and dedication to its mission. Thank you so much to the chair of the New Hampshire DYW program, Eve Marie Lynch, for reaching out and incorporating me into the program. Experiences like these make me prouder than ever to be representing DYW this year!